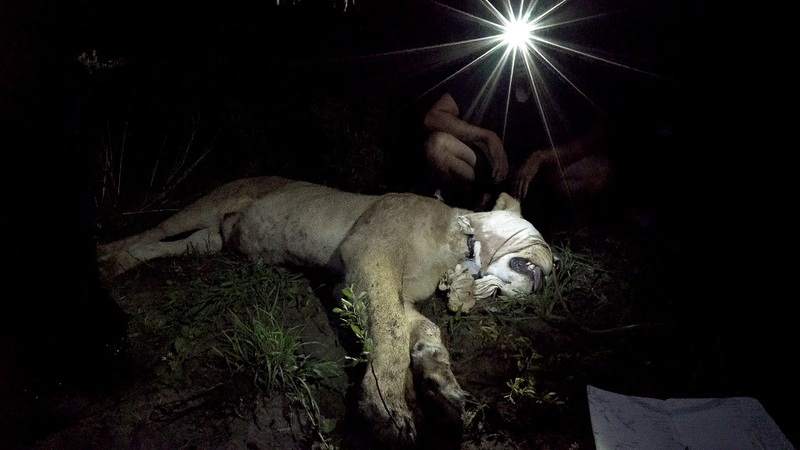 This lioness has been sedated so that researchers can place a collar on her and keep track of her movements as part of the Pride in Our Prides lion conservation project. (© CLAWS Conservancy). It is 4 p.m. on Sunday, 23 April 2017. Mr. Matsimela* receives a message on his cell phone with the following information: Good afternoon. Mutlawankanda and Nduraghumbo [two collared male lions] are moving back into Beetsha area. They are 4 km east of Matswii and Nxeku along the Okavango Delta channel, please kraal cattle at night and inform other people in your area. Thanks, Flo. (*Name changed). Mr. Matsimela lives in the village called Beetsha, and his cattle graze in the surrounding area. He is also a village elder who knows everyone in the area and has been given the responsibility to pass the information on to others. Having received the text, he spreads the word through cell phone messages and word-of-mouth. He calls his herder and asks him to find the cattle and make sure they are brought in for the night. Additionally, he sets to work with his family to build fires around the cattle enclosure that will keep the lions at bay. His message reaches the people farming closest to the lions’ position. This family has recently received a sturdy cattle enclosure from the Pride in Our Prides project (PiOP), who sent the initial warning message. They chase their cattle into the enclosure and close the gate securely, knowing that their cows are safe, even if the lions come right up to the enclosure. During the night, the lions came to the well-built enclosure, but they could not enter, or scare the cattle into breaking out of the enclosure. They carried on to the village, but skirted around Mr. Matsimela’s farm due to the fires he had set around his traditional cattle enclosure. Seeing the lions by the firelight, some young men came out banging tin plates and shouting. The lions took flight and left the village, heading back to the safety of the Okavango Delta. The story above typifies the work done by CLAWS Conservancy’s Pride in Our Prides project among communities living in the far northern region of Botswana. 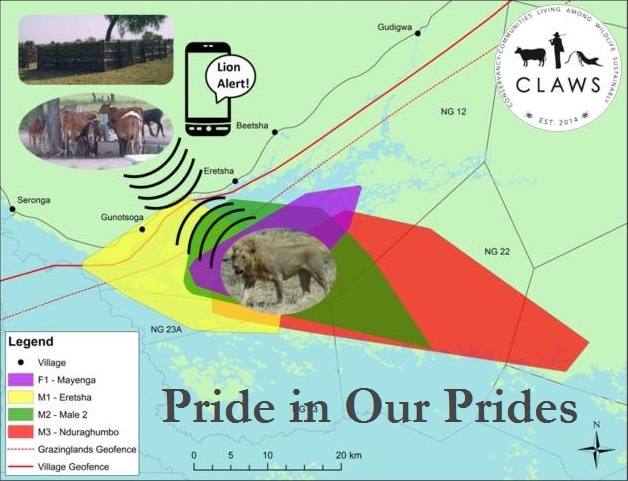 As recently as 2013, before Pride in Our Prides began, the lions’ approach would have gone unnoticed until the next morning, when farmers discovered several dead cows. Their response to continued livestock losses from lions was to poison livestock carcasses, in the hope that they would kill the responsible lions. Poisoning events in 2013 killed 50-60% of the known lions in this area, and caused the deaths of many vultures and other scavenging animals. It was clear that something needed to be done to help the local people find better ways to live with lions. 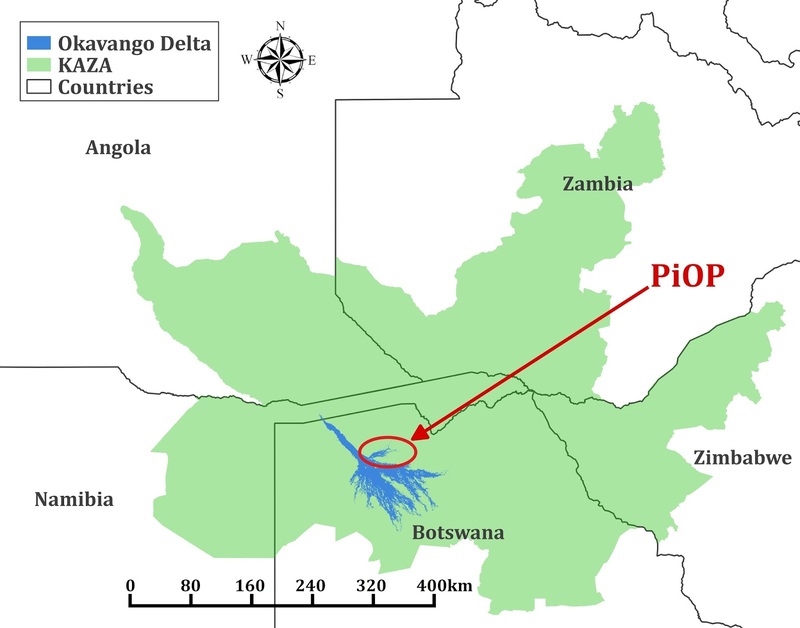 The founder of CLAWS Conservancy, Dr. Andrew Stein, immediately recognised the importance of this lion population, as it lies in a key part of the KAZA Trans-Frontier Conservation Area that includes parts of Botswana, Namibia, Zimbabwe, Angola and Zambia (see map). Although KAZA encompasses several protected areas in the member countries, subsistence farmers occupy the land between these wildlife areas, where they grow crops and raise livestock. If lions cannot move through farming zones between protected areas, then this lion conservation stronghold may become fragmented and isolated, which is the first step towards losing this population altogether. The KAZA Trans-frontier Conservation Area (in green) covers parts of five southern African countries, including Botswana. The project area is at the heart of this landscape, where communities live on the edge of the Okavango Delta World Heritage Site. (Map created by: Dr. Florian Weise). Dr. Stein partnered with Dr. Florian Weise, who currently heads the PiOP project with assistance from the local community liaison Mr. Mathata Tomeletso. Both researchers have years of experience working with livestock farmers to address the conflict between them and large carnivores, particularly cheetahs and leopards. One of the key lessons they learned was that information and transparency are critical requirements for successfully changing farmer attitudes and hence their reactions to large carnivores. They found that the judicious use of satellite collars and consequent information on animal movements could be a game changer for large carnivore conservation. Farmer hostility turned into genuine interest in individual carnivore movements. Suspicion about the motives of carnivore conservationists turned into working relationships that brought farmers into the conservation world, rather than alienating them. The PiOP project operates on the same principles of information sharing and transparency, and their strategy has once again yielded positive results. To add to the community buy-in to the project, the local villagers are asked to give their own names to individual lions that are collared. The act of naming a lion gives the community a sense of ownership and personal connection, in that they now see the lions as individual animals with different characteristics, rather than branding all lions as a problem. One lioness was named “Maleherehere” which means “the Sneaky One” – for good reason. This particular lioness has had close encounters with hostile people in her life (shown by old gunshot wounds in her shoulder), and has learned to sneak away quickly after killing and eating cattle. Even the researchers have confirmed her ‘sneakiness’ as they battled for several days to dart her for collaring! The two male lions in the lion alert at the beginning of this article were also named by the community. Nduraghumbo or "Head of the Homestead" is an old male, previously part of a coalition that was killed by villagers before the project started. Mutlawankanda "One who forages for food" associated with a pride consisting of two females. One of the men from the village said, "I like Mutlawankanda, he has two wives like me", thus revealing his new connection with lions. Currently, six lions from five prides living on the edge of wildlife management areas and near communal livestock grazing lands have been collared. The lions in these prides are the most likely to cause livestock losses, and the collared individuals are those that are identified as pride leaders or are known to have caused livestock losses in the past. The collars are programmed to send Dr. Weise a text message whenever they cross one of two virtual lines (or ‘fences’) that correspond with: 1) the areas where livestock graze, and 2) within a few kilometres of five focal villages. He translates the detailed information (exact GPS location, direction of travel) into an understandable warning message that can be used by the community to proactively protect their livestock. The effort put into the community programme has paid off – since the PiOP project began in 2014 no lions have been poisoned, and during 2016 not a single known lion was killed using any means. This graphic is used to explain to communities how the lion alert system works. This system ensures that livestock farmers can proactively protect their livestock from lion predation. (Graphic by: Dr. Florian Weise). In future, the CLAWS Conservancy team aims to make the project self-sustaining by employing the current community liaison officer as the project leader. A key part of this strategy is to fine-tune the lion alert system and automate it, thus reducing the need for an expert to translate and transmit the information. To this end, they have partnered with Professor Volker Wulf and his team from the University of Siegen in Germany. Prof. Wulf has developed the field called Socio-Informatics, which aims to make highly technical information conveniently available to local communities in a form that they can understand and use. For the PiOP project, they will engage with the community to find out: what types of cell phones are predominately used; the local level of literacy; which languages and/or images are widely understood; the kind of information from the lion collars that will be most useful. They will use this knowledge to create a user-friendly cell phone application that will provide the right information to the right people, at the right time. Although the lion alert system is an innovative solution to the ancient problem of human-lion conflict, the CLAWS team does not view it as a silver bullet that will fix the problem by itself. Rather, lion alerts are part of a much broader, holistic plan to change the way livestock are managed and encourage sustainable farming that is adapted to local conditions. As part of this strategy, they are building strong cattle enclosures that can withstand lion attacks, to replace the current traditional enclosures that cannot deter lions. They have built 17 enclosures to date and closely monitor their use by farmers; no losses have been recorded from within these enclosures over the past two years. The livestock enclosure on the left was built by the Pride in Our Prides project, and is predator-proof. The traditional enclosure on the right is designed to keep livestock inside, but cannot prevent predator attacks. (© CLAWS Conservancy). Another major challenge is to encourage people to employ full-time herders that protect their livestock during the day and bring them in at night. At the moment, most farmers allow their cattle to wander unprotected during the day, and battle to find them to bring them in at night. Consequently, the CLAWS team plans to partner with several other conservation groups who can assist with farmer education and herder training in future. Herders are a critical part of pro-active livestock protection and grazing management. (© CLAWS Conservancy). The innovative, highly practical methods used by CLAWS in this project are to be lauded as an example for other human-wildlife conflict practitioners to follow. Perhaps even more remarkably, they are using rigorous scientific methods to monitor and test the relative success of all aspects of the PiOP project. This strategy shows their commitment to not only reducing human-lion conflict at a local scale, but to use the knowledge gained to inform conflict mitigation measures worldwide. Furthermore, the technology used for the lion alert system has great potential for other conservation-related uses, such as anti-poaching. This pioneering work in northern Botswana is breaking new ground for global conservation efforts. If you would like to find out more about CLAWS Conservancy and how you can get involved, check out their website. We will keep you up to date on the PiOP project’s progress in future articles of Conserve Botswana.